The mosaic you’re seeing below isn’t one of marble or ceramic. It’s a living breathing one made by children. When human discipline and harmony are put together, the most beautiful creations can be conceived. Standing in the largest stadium in the world with giant colored flip-books containing hundreds of colored panels, tens of thousands of children moved in perfect unison to create a stunning human mosaic in front of a crowd of 150,000 people. The occasion for this beautiful tableau is the Arirang Festival Mass Games held in Pyongyang, North Korea. The event runs from August to October – almost every year- and is an impressive spectacle of perfectly choreographed gymnastics, dancing, and singing, in honor of Korea’s cultural heritage and the achievements of its eternal leader Kim Il-Sung. 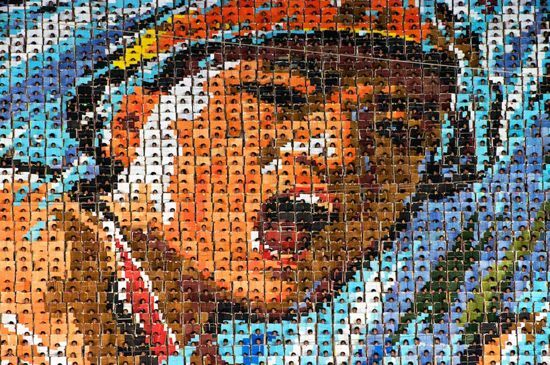 The performers on Rungrado May Day Stadium manipulate their panels for two hours, offering incredible mosaic scenes that change every 20 seconds. Organizers are reportedly planning a whole new experience this year since 2013 marks the 65th anniversary of the foundation of the republic (Sept 9) as well as the 60th anniversary of the singing of the armistice that ended the Korean war (July 27).